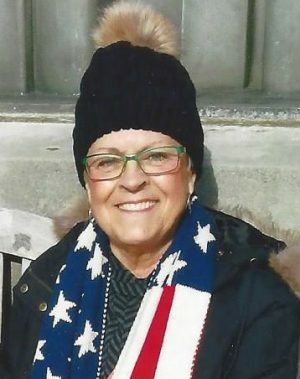 FULTON, NY – Lorraine Lowden, 67, passed away on Tuesday February 27, 2018, peacefully at home. Born in Hertford, England, she was the daughter of Herbert and Gladys Reffold. Lorraine graduated from G. Ray Bodley High School and had attended Jefferson Community College. She was employed at Farmington Veterinary Clinic where she worked at the front desk and as an assistant. She enjoyed reading, traveling, gardening, shopping, sunshine and spending time with her family, friends and doggies. She will forever be remembered for her smile, kind heart, love for life and positive attitude. She is survived by her mother, Gladys Reffold; daughters, Kimberley Badger (Bryan) and Amanda Lowden-Fleig (John); sisters, Mary Pooler (Gary) and Christina Petroski (Peter); niece, Tracy Petroski; grandchildren, Madison, Drew, Noah, Karter, Lucas, Ashlyn, Meghan and Ryan; and her beloved doggies, Lottie and Bing. She was predeceased by her father, Herbert Reffold; and her niece, Sara Pooler. Graveside services will be held at Riverside Cemetery, 4024 County Route 57, Oswego, NY, in the spring. Memorial donations may be made to Rescued Treasures Adoptions, 3177 Latta Road #161, Rochester, NY 14612.